New records set for background concentration and bulk film electron mobility. Agnitron's growth work is featured in the June Issue of Compound Semiconductor Magazine. Upgrading and supporting productive MOCVD systems around the world. Imperium is a fully supported modern Windows OS and SQL based control system upgrade for process equipment. It is the most flexible, robust and safe solution for addressing risks and limitations associated with productive yet unsupported machines. Adaptable configurations to keep pace with your breakthroughs. Agilis is an advanced R&D tool offered with a menu of configuration options, low cost of ownership, options for field upgrades and supports growth activities at a range of starting price points for various materials including III-V, oxides, TMD and others. Systems with refurbishment and upgrades make MOCVD available for most budgets. The Agnitron difference is delivering Certified Refurbished and Upgraded Systems with factory services such as preshipment demonstration, installation, facility preparation support, training, growth demonstration and warranty. Offerings include OEM specification equipment, upgraded systems as well as turn-key solutions. We’re here to help with the expected and unexpected. MOCVD systems are complex and can even be hazardous – making them operate at their best requires high quality components as well as regular expert service. We offer comprehensive parts support for most MOCVD systems and a range of equipment support services including preventive maintenance, system audits, decontamination, decommissioning and related services. 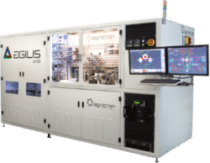 Agnitron Technology, Inc. is a compound semiconductor technology company and supports MOCVD equipment related needs of R&D and production users. We strive to deliver products and services to enable development of advanced semiconductor material and device technologies and products which improve quality of life and the environment.